Soon after graduating from college in 1968, Abigail Child began a filmmaking career that would become one of the most influential of the American avant garde canon. Her early work launched at a time when the agitprop documentary would gain mainstream acceptance for the first time in American history that, coincidentally, was also a time when the civil rights movement would finally be thoughtfully critiqued and publicly debated. Child’s films, though not all fitting the documentary model, have a distinct activist quality that are perhaps more apparent in documentary filmmaking. There is, however, an aesthetic quality in her films more often associated with the avant garde and similar to the films that Kenneth Anger was making about sexuality and gender at the beginning of his career – the politically fearless Fireworks (1947) and nostalgic Puce Moment (1949) come to mind – in a sense that is utterly self-conscious about its form and address. Mutiny (1983) is, in a combative way, full of fun and could be misread by some viewers who don’t like to be put on the defensive. It is the second part of Child’s Is This What You Were Born For? series about the experiences of women in New York City, and is comprised mostly of footage shot by Child – the dancer Sally Silvers, the violin player Polly Bradfield are all contemporary artists and friends, shot in 1981-83 on streets and offices in NYC. There is other material taken from early documentaries including the high school girls and Bronx street gang [for commissioned docs Between Times (PBS) and Savage Streets (NBC) respectively] as well as from her early doc Game (1972), shot with Jon Child. Using a 16mm camera that records on magnetic track, the film employs lightning fast editing to imitate and then deform modern representations of femininity at home, at work and in public. The active viewer who can see the pattern eventually realizes that these intercutting scenes depict many of the women in mid-cheer: chattering, singing, jumping on gymnastic apparatus, even dancing. Most are aware of the camera and some aren’t, or at least aren’t bothered by it. Conversations rise and fall; shots are fed through upside down and run in reverse, while one woman does an interpretive dance in the middle of a busy workday in an urban office, another drunkenly confides to us and to Abigail Child, and, in a way, to the other subjects in the film. Not one scene is ever made clear; no utterance makes sense, a babbling crescendo. But it is in the film’s kinetic nature, and in the true Eisensteinian sense of montage, that the meaning becomes apparent when all the disparate sequences are cut together, compared and seen as a whole. Ultimately, a general discontentment is sensed in the growing action with the same feel and style as Arthur Lipsett’s classic Very Nice, Very Nice (1961). But Lipsett was a lot more hip. B/Side (1996) is more morose. The kinetic editing that underlines our understanding of Mutiny, here is deliberately paced at a speed better suited for attention to composition and character though with a similar sporadic rhythm. The film’s centerpiece is a shantytown close to the heart of the city’s financial centre that houses a small group of homeless men and women. Child has created a protagonist of sorts, played by New York actress Sheila Dabney. There is an insensate quality to her daily routine; we watch her sleep, wake, and wash – ironically evoking the sleepy, pastoral mornings of Humphrey Jenning’s poetic, nationalist masterpiece London Can Take It (1940) – before she begins her wanderings along Manhattan’s Lower East Side. These are jarringly intercut with a love scene between Dabney and a young woman. Like a silent melodrama, her interior mindset – fantasies and all – are shot and presented for audience scrutiny. This blend of documentary and narrative address offers a complicated depiction of class, racial relations, economics and the sadness at the heart of the growing alienation of the homeless and working poor in contemporary America. In the 21st century, her films to continue to investigate the everyday drama of contemporary America by looking into the past, primarily with found footage. She has become a sought after world-class installation artist, creating split-screen, didactic meta-narratives at galleries around the world. The above reviewed films, along with The Game (1972), are part of the upcoming Abigail Child presentation at DIM Cinema. 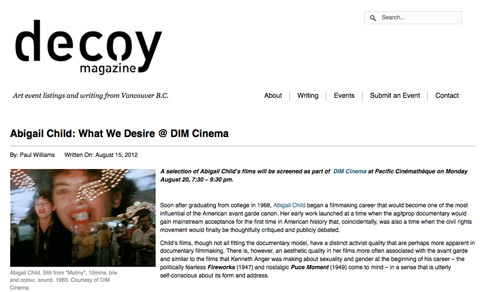 DIM Cinema is a continuing series of avant garde works by important domestic and international filmmakers; the program is curated by Amy Kazymerchyk and screened monthly at the Pacific Cinémathèque in Vancouver, Canada.